Functional boundaries and formal hierarchies that served us well for decades now inhibit our organization’s ability to compete with more nimble competitors. Today, dynamic teaming across the organization and leading from every level are essential — organizations that do it well see 12% revenue growth compared to just 4% by peers. Unfortunately, teaming and leading across perceived boundaries doesn’t come naturally to most people. In WorkBoard's November Brilliant Leader webinar leadership expert Courtney Harrison discussed why we need fluid teaming and dynamic leadership, and how to cultivate them faster. A decade ago, companies had far more time — often years — to contemplate and respond to competitors, plan strategies and align the troops on execution. 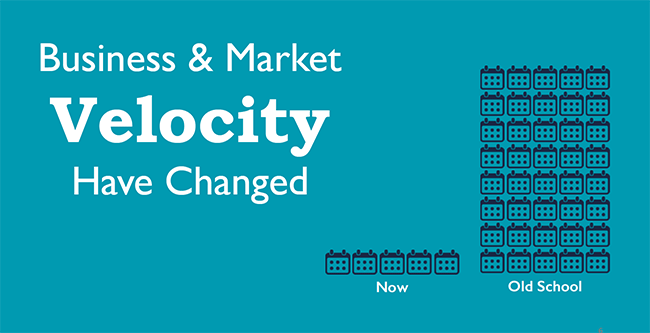 Today, companies have just months to strategize, plan and execute responses because market and business velocity have changed dramatically. Boundaries have changed too, from functional to cross-organization, from 9to5 to 24x7, and from single entity to network collaborators. 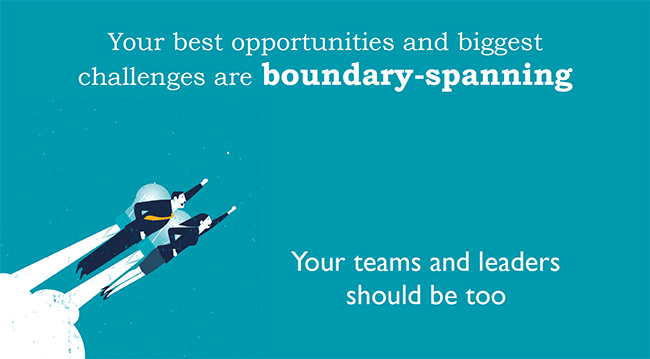 To span boundaries more easily, understand people, how they team up best, develop boundary-spanning leadership skills and tools as accelerators. Because humans are wired for survival, our default is to view others as friend foe. Our brains are tuned for survival and status quo. Business requires collaboration, agility and change yet people aren’t naturally wired for these. In fact, cross-organizational collaboration can trigger instinctive defenses. These natural instincts help explain why strategy and transformation initiatives so often fail. While common ground is key to team success, you need to first build a foundation of trust and respect between people that addresses basic human instincts. Have a conscious model for teaming to accelerate how quickly and well people work productively together. Will Schutz's research and FIRO-B model identifies our three primary interpersonal needs and dynamics. When teams are aware of each person’s preferences to be included, for control and for openness, they are more effective together. Inclusion: The desire to be included and include others varies from person to person. For some, being included is a strong motivators, for others less so. Control: The need to be in charge or not be managed by others. For some, it's very important to lead, not be directed by others, and make the decisions while for others it's less important or desirable. Affection: The need to be liked and willingness to disclose personal feelings to others. 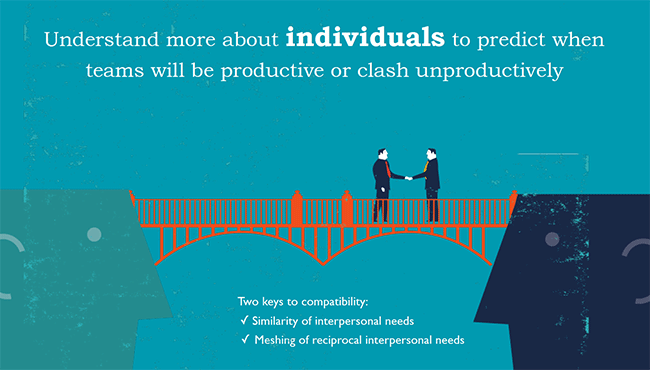 While some individuals have a strong desire to be close and connected with others, peers may desire less connection. Leaders can easily identify where conflicts will occur or productivity will suffer: Two people with equally strong need to be in control or eight people where no one has a strong need to be in control, for example. With this insight, leaders can facilitate conflict and optimize team composition. Using the FIRO-B® instrument can improve awareness of different preferences and improve team dynamics. After decades of massive scaling and M&A, many organizations now have “one company” initiative underway to improve cross organization leverage and synergies. Chris Ernst identifies five basic leadership boundaries: vertical, horizontal, geographic, stakeholder, and demographic. Of these, CEOs are most concerned spanning horizontal boundaries and developing leaders that go beyond the boxes and lines on org charts. Just one in ten leaders are effective leading across the organization. To cultivate enterprise leaders, reframe boundary perceptions and institutionalize real-time transparency. The traditional -- and labor intensive -- quarterly operations and business reviews used for cross-group transparency are relics of times past. Dynamic teaming and leading require continuous, broad-spectrum transparency. Provide people with the tools to scale their thinking and actions and to remove barriers. Apps like WorkBoard help people instantly team across functions on immediate, shared goals and more easily coordinate cross-functional work. When leaders consistently see peers' goals and work in flight, they can identify and act on opportunities to share expertise, resources, insights and work product. Listen to Courtney’s full webinar with experiences from her tenure at US Olympic Committee, American Express, and Juniper for examples and insights.